Easy and fun to build, this unicorn will roam your child's imagination, discovering new magical lands. Noble and beloved, unicorns are also legendarily shy. Hiding in their mystical rainbow lairs, the magical beasts are almost impossible to capture. It's easier to build your own baby unicorn so it'll grow up feeling comfy around humanfolk. This sweet junior unicorn will roam a child's imagination, discovering new magical lands (or is it the other way around?) and helping them improve their concentration and precision as they grow confidence in their own creative powers. Easy to assemble and fun to build, the design is made of eco-friendly, recycled cardboard with safe, rice-based inks and organic, non-toxic glue. Numbered pieces come together to make a contoured creature in about 20 minutes. Designed in New Zealand; made in China. It's fun to make, and is going to be decorative on my granddaughter's dresser! Easy but meaningful for personal effort and a cute decoration I personalized with a note about being unique. Cardboard and glue. I little messy for small kids. 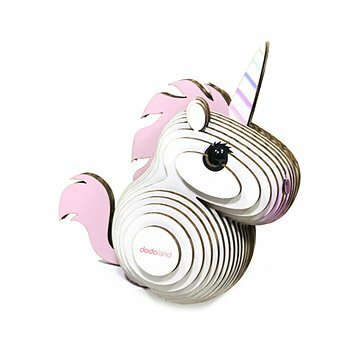 Perfect for the unicorn lover in all of us!